A new generation of multinational K-pop groups is emerging, ready to take on the global music scene. Some earlier experimental groups, such as girl group ChoColat, created by Paramount Music in 2011, included members of German, Italian and Puerto Rican descent. The group, however, has not been active since 2013. Miss A, one of K-pop’s most popular multinational groups with Chinese members Fei and Jia, is facing a shaky future with Jia having left the group’s agency JYP Entertainment in March. One group that may lead the resurgence of multinational K-pop groups is S.M. Entertainment’s NCT 127, the Seoul edition of the major music agency’s most recent project. The group consists of seven members, including Chinese national Winwin, Japanese national Yuta, who previously appeared on the international talk show “Non Summit,” Canadian national Mark and Korean nationals Haechan, Taeyong, Taeil and Jaehyun. NCT 127 will debut on air on Thursday and release its debut album on major Korean music streaming services on July 10. The title track, S.M. has revealed, will be “Fire Truck,” a beat-heavy track fusing hiphop, trap and the reggae-house hybrid genre moombahton. NCT, which stands for “Neo Culture Technology,” is a new project the major K-pop agency launched this year. According to the company, it is an envelope brand for the many different unit groups -- including NCT U, which debuted in both China and Korea -- that will be active throughout the world and “localized” for fans in each country. The number 127 in the group‘s name NCT 127 represents Seoul’s longitude. 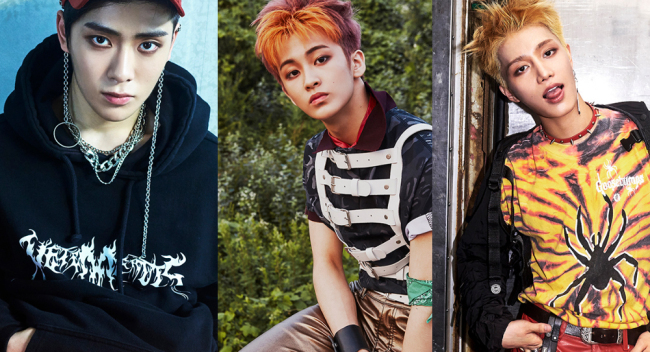 NCT U, which includes Thai and Korean members, debuted in April with singles “The 7th Sense” and “Without You” to significant global popularity. The video for “The 7th Sense” became the most-viewed K-pop video on YouTube that month with over 13 million views. The 12-member girl group Cosmic Girls is another rising multinational group that has been active both in and out of the country lately. A collaborative project between Starship Entertainment and China’s Yuehua Entertainment, the group debuted in February this year with its first EP “Would You Like?” and title track “Mo Mo Mo.” It has three Chinese members -- Cheng Xiao, Xuan Yi, and Mei Qi. The group has been active in various fields. Just this week, Cosmic Girls signed an ad deal with cosmetics brand Skin 79. It is currently appearing on a reality show titled “Would You Like Girls: My Cosmic Diary,” where, in last week‘s episode, the girls traveled to Shanghai and were stopped on the streets by swarms of fans there. The six-member boy band Cross Gene has been focusing on the overseas market. Consisting of Chinese member Casper and Japanese member Takuya alongside Korean members Shin, Sangmin, Yongseok and Seyoung, the group on June 20 held its first fan meeting in Singapore. The event attracted fans from Thailand, China, Taiwan, Indonesia, Hong Kong and Malaysia, according to its agency Amuse Inc.